Klobuchar’s home-state popularity is greater than that of the four other Senate Democrats to enter the 2020 presidential race. 86% of Democrats, 52% of independents and 30% of Republicans in Minnesota approve of her. Only Sens. Bernie Sanders (I-Vt.) and Jon Tester (D-Mont.) are more popular among Democrats in their states. Sen. Amy Klobuchar, the latest to join the growing field of Democratic presidential candidates, is beginning her campaign with a low national profile. But among voters who know her best, the ones in her native Minnesota – part of a region where Democrats lost ground in 2016 – she grades extremely well. Fifty-eight percent of registered voters in Minnesota approved of Klobuchar’s job performance in the fourth quarter of 2018, making her the third-most popular Democratic senator in the latest Morning Consult’s Senator Approval Rankings, behind Brian Schatz of Hawaii and Patrick Leahy of Vermont, the most popular Democrat. 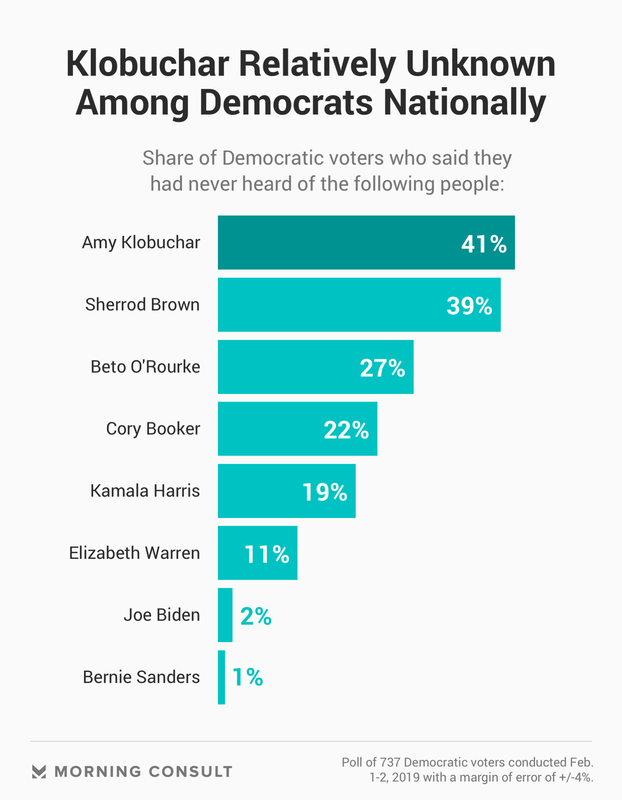 And compared with the four other Senate Democrats who also say they are running for president, she’s the most popular among her own constituents. The Gopher State’s senior senator will hope that her “Minnesota nice” public profile warms voters at the national level, where she remains relatively unknown, even among Democrats. The latest Morning Consult/Politico national survey, conducted Feb. 1-2, found 41 percent of Democrats – and 47 percent of voters overall – said they’ve never heard of Klobuchar, more than twice the share who were unfamiliar with California Sen. Kamala Harris and nearly four times the share who said the same of Massachusetts Sen. Elizabeth Warren. Twenty-two percent of Democrats said they have never heard of New Jersey Sen. Cory Booker, and 36 percent said in a Jan. 18-22 survey they’d never heard of New York Sen. Kirsten Gillibrand. It makes Klobuchar one of the least-known presidential aspirants, compared to other possible top Democratic contenders, though her name ID has increased in recent weeks amid talk of a possible presidential bid. Among Democrats nationwide, 27 percent said they had a favorable impression of her and 9 percent said unfavorable. Her home-state metrics stacked up favorably compared to that of her colleagues. Eighty-six percent of Minnesota Democrats approved of Klobuchar, according to Morning Consult’s latest quarterly rankings, based on surveys conducted Oct. 1-Dec. 31, making her the third-most popular member of the Senate Democratic Caucus with her own base – just behind Bernie Sanders of Vermont, an independent who caucuses with Democrats, and Montana’s Jon Tester, the most popular. 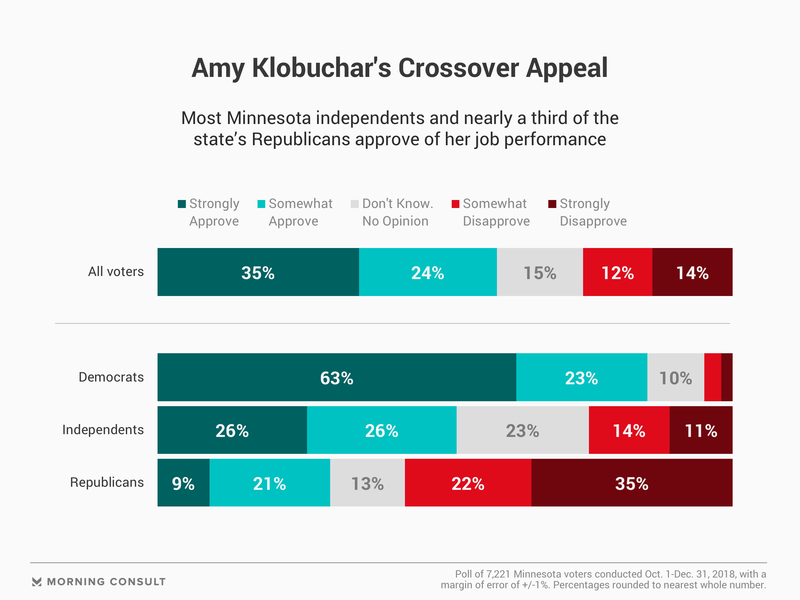 She also stands out with independents compared with her colleagues, with her 52 percent approval rating among those voters in Minnesota placing her fourth among all senators in the last Congress. Additionally, 30 percent of Republican voters approved of her job performance, placing her just outside of the top third of her caucus in terms of net approval among GOP voters. Such crossover appeal – if it can manifest nationwide – could help in the general-election phase of a campaign. However, it remains to be seen whether a candidate with comparatively moderate proclivities can capture the support of the Democratic base among a group of candidates who are outspoken on liberal issues such “Medicare for all” and the ambitious Green New Deal. Morning Consult data suggests Democratic voters are putting a big premium on electability. A Jan. 25-27 survey found the bulk of Democrats (44 percent) said the most important thing they were thinking about when it came to their primary vote was selecting a candidate who has the best chance of beating President Donald Trump — roughly twice the share of the 24 percent who said it was most important the candidate share their values and 21 percent who prioritized the candidate sharing their preferred policy positions.